I promised you I’d update Mama’s efforts to rid the house of bats, right? Hmph, she hasn’t been very successful. The other night (actually early morning) I was deep into my snoozle when I noticed Mama wasn’t in her bed. The door was closed, and I assumed (wrongly) that she’d sneaked downstairs for an early doughnut. Suddenly, the door flew open and there stood my mama, butterfly net in hand and a murderous glint in her eye. She made a few swipes through the air and practically did her Happy Dance. Then she raced downstairs with net in hand, calling me to Come. Of course I did. What doggo is dumb enough to miss out on the fun when there’s something to be chased? Or a treat to be received? Mama went outside, with me close on her heels. I used the time to do my early morning business, but she was whacking that net on the grass. Something inside the net was clicking. I thought it might be a bomb, but no. 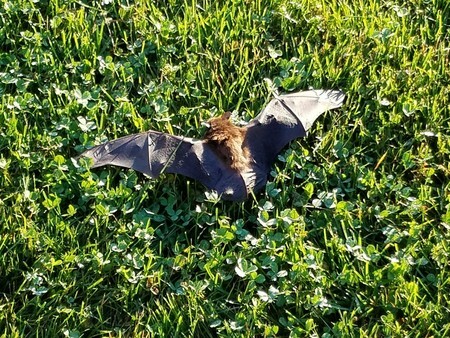 It was just another bat! When we got back in, Mama asked me how come I hadn’t seen the thing swooping around and set off my alarm bark. Gosh, Mama, do I have to do everything?? This entry was posted in Seasonal and tagged another catch, bat, butterfly net. Bookmark the permalink. :-) Success!!!!!! Bat be gone! Beth Ann, I wish there was a product called “Bat Be Gone” that would keep the little dudes from entering a house in the first place! Dallas, they’re going to start calling your mama “that batty old woman”! More seriously, one bat is an accident. Two might be a family setting up shop. I just read that they can get in through cracks as small as 3/8″. That’s hard to believe, but they’re sure getting in somehow! Miss Linda, Mama is blaming this one on the new cleaning lady, who was toting mops and buckets in and out without worrying about keeping the doors shut. You’re right, the beasts can slip in through cracks as thin as a dime (the skinny part, not the face!). Do you think they’re the reason I Dallas can’t seem to keep doughnuts around this house?!? HAHAHAHAHAHAHA! Dallas, you need to have your own blog where you can share your stories because you’re a RIOT! And yes, I remember the last encounter you and Mama had with a bat. And is it my imagination, but wasn’t the last one in October as well? Ummmm….perhaps it’s a sign that HALLOWEEN is this month. BOO! Great post, Dallas! Tell Mama I said, Hello. Ah, Mr. Ron, you’ve got a good memory! Let’s blame the whole episode on Halloween, how about it? Personally, I Dallas think they saw Mama bring in a box of doughnuts and ever since, they’ve set a goal of getting in and depriving me of them. Maybe Mama’s right and I should set to barking to shoo them away. Something tells me it’s not the same bat, ha!! Not that I’m killing the ones I catch, of course (they’re protected, you know). Next time ask if it is the same. I Dallas love your perspective, Tommy and Tuppence! Indeed, Mama is most entertaining, especially when she’s got that net in her hands. And I like to watch her prepare my food, too! Glad to make you smile, Miss A!! Thanks, Miss Virginia — ooh, those bat emojis give Mama the creeps, ha!! Oh no Dallas. I would freak out if I had bats in my abode. You have one tough Mama for attacking those creatures. I am often plagued by mice in the house. Are you any good at chasing those? HaHa, I’m not a cat, Miss Pat! No, I have no experience chasing mice, but I am a herding dog so I’m certain I’d give it a go. Mama says she didn’t know you had mice in your part of the world — Central Illinois, of course, does, especially at this time of year when the farmers are harvesting and the weather is cooling.